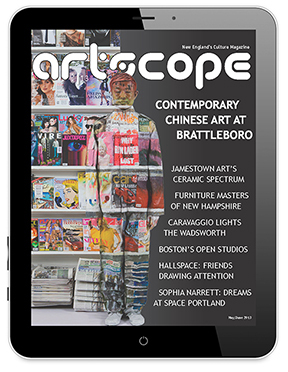 :: Sponsored by: North Bennet Street School, ArtSpace Maynard, Artrageous!32, Fruitlands Museum, Milton Art Center, Solomon's Collection and Fine Rugs, Vizivel, Derryfield School Lyceum Gallery, University Museum of Contemporary Art at Umass Amherst, and the Artscope Tablet Edition. This week we're presenting Hera Gallery, Lamont Gallery at Phillips Exeter Academy, and Fruitlands Museum with exhibitions about reconfiguration, both of physical objects and intangible ideas. There are other interesting and exciting events for those who want more. Artscope is sponsoring Artrageous!32, Monsterrat College of Art's annual auction fundraiser taking place on Saturday April 7 from 6:00pm - 10:00pm. Tickets are on sale now. We are also sponsoring CraftBoston Spring, happening April 20 - 22 at The Cyclorama at Boston's Center for the Arts. For more information and to buy tickets, please viit the Society of Arts + Crafts's website. The 2018 Portland Museum of Art Biennial is now open, and will be on view until June 3, 2018. Ed Ferszt, "2 Out of 4 Elements-Earth Plowed," 2015 Watercolor on Paper 40" x 40"
The Hera Gallery is currently featuring: "New Work" by Ed Ferszt and "Flux: Cycles of Change" by Sarah Swift, a two person show until March 31. Both are Rhode Island artists who use their art to explore natural elements like earth, water, and air using the environment of South County, Rhode Island as inspiration for their work. Ed Ferszt has embraced water-based mediums for decades. His most recent work is created on stretched paper and creating both small and large contemporary watercolors. Swift works with various materials such as old clothes, plastic bags, and other forms of trash which are painted, collaged, or torn apart before being brought back together. The practice of creating with reusable material has long inspired her work. There will be an artist talk on Sunday, March 25 at 3:00pm. Hera Gallery is located at 10 High Street in Wakefield, Rhode Island and is open Wednesday - Friday 1:00pm - 5:00pm and Saturday 10:00am - 4:00pm and by appointment. For more information, please visit heragallery.org/current. Sponsored by: North Bennet Street School, ArtSpace Maynard, Artrageous!32, Fruitlands Museum, Milton Art Center, Solomon's Collection and Fine Rugs, Vizivel, Derryfield School Lyceum Gallery, University Museum of Contemporary Art at Umass Amherst, and the Artscope Tablet Edition. Elevate your art, or explore an entirely new discipline. NBSS offers intensive, hands-on training and an inspiring community. Beginner through advanced classes in Bookbinding, Jewelry Making, Furniture Making, Carpentry, and Musical Instruments. Located in Boston's historic North End. ArtSpace Maynard invites artists in all media (except video) to submit proposals for one month solo or group exhibitions for the 2018-2019 season. The proposed exhibit should be based on a unifying concept that is social, historical, philosophical, cultural, political or other. The ArtSpace Gallery is one of the largest nonprofit exhibition spaces in Massachusetts. Preference will be given to New England artists. For guidelines go to: www.artspacemaynard.com/proposals. Montserrat College of Art's annual gala art event - Artrageous!32, will be Saturday, April 7, 6 pm at North Shore Music Theatre, Dunham Road, Beverly. Bid on works by students, faculty, alumni, staff and emerging and established artists from the region and beyond. Proceeds benefit student scholarship. Get tickets and view art at www.montserrat.edu/auction. Work in progress by Candice Smith Corby, response to a painting by William Thomson Bartoll, Portrait of Margaret Prentiss Allen with Twin Sons, James & Judson, 1850. "Conversations in Craft: Furniture from The Trustees Collection and North Bennet Street School Artisans"
"A New View: Landscapes from the Permanent Collection." Winter hours: Saturday -Sunday 12:00pm - 5:00pm. Open for main season April 14. (See website for hours). Gallery 334, Milton Art Center, invites two-dimensional artists to enter its annual Juried Show opening April 27th. James Stroud founder of Center Street Studio is the juror. Submit through ShowSubmit.com starting February 18th through April 6th. Artists will be notified by April 13th. Detailed prospectus available online at www.miltonartcenter.org. On view at Lamont Gallery at Phillips Exeter Academy through April 21 is "Representing Feminism(s)." This exhibition is an exploration of the nature, utility, and meaning of feminism by over thirty contemporary artists working in a variety of mediums. "Representing Feminism(s)" was developed by Gillian Allou, Nicole Blanco, Mai Hoang, Jacob Hunter, Maya Kim, Andrea Liu, Natalie Love, Rose Martin, Olivia Ross, Gabriella Sanders, Alexandra van Dijkum, Luna Vassao, and Wendi Yan, all student curators at Phillips Exeter Academy. According to the Lamont Gallery website, the intent of the curators in creating this exhibition was "to consider how feminism can be represented and, when necessary, reconceived." The wide variety of work presented in "Representing Feminism(s)" allows the viewer to consider these ideas as well as letting them formulate their own response towards feminism in the modern era. The Lamont Gallery is located in the Frederick R. Mayer Art Center at 11 Tan Lane in Exeter, New Hampshire and is open Tuesday - Friday 9:00am - 5:00pm and Saturday 10:00am - 4:00pm and Mondays by appointment. For more information, please visit exeter.edu/arts-exeter/lamont-gallery/performing-feminisms. Sunflower chest, detail, circa 1690, Wethersfield, Connecticut, oak, pine, maple, Part of collection at Mission House, MH.F.A. "Conversations in Craft: Furniture from the Trustees Collection and North Bennet Street School Artisans" is currently showing at Fruitlands Museum until April 29. Curated by the Trustees' Senior Curator Christie Jackson, "Conversations in Craft" is a collaboration with North Bennet Street School (NBSS) artisans. The artisans worked with Jackson to select a piece of historical furniture from the Trustees collection and create their own work in response to it. 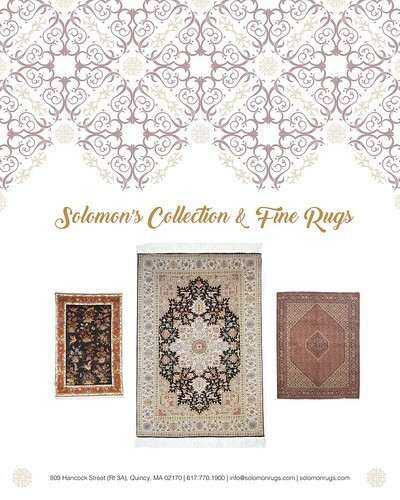 The NBSS artisans are not merely replicating the pieces, but rather "answering" the piece in their own ways by creating a companion piece or expanding on the historical object's patterns or motifs. "Conversations in Craft" offers the viewer a comparison between the historical and the contemporary, showing that each is just as valuable and beautiful as the other. Fruitlands Museum is located at 102 Prospect Hill Road in Harvard, Massachusetts and is open Saturday - Sunday 12:00pm - 5:00pm until March 25. Fruitlands Museum will close from March 26 - April 13 and will reopen on April 14 and from then be open Monday, Wednesday - Friday 10:00am - 4:00pm and Saturday - Sunday 10:00am - 5:00pm. For more information, please visit fruitlands.thetrustees.org/exhibitions. 5 Takes on African Art / 42 Flags by Fred Wilson. African art drawn from the collection of Charles Derby, a UMass alumnus who has been collecting since the 1970s. Surrounding them are Flags of Africa by the African American artist Fred Wilson. Through April 29th.